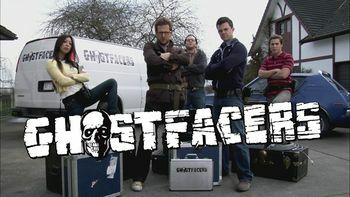 The Ghostfacers was the name adopted by Harry Spengler and Ed Zeddmore for their reality TV series pilot about a group of paranormal investigators. The Ghostfacers is run out of Ed's parents' garage. Ed and Harry had previously run the Hell Hound's Lair website as seen in 1.17 Hell House. Harry & Ed are self proclaimed "professional" paranormal investigators and co-runners of the website Hell Hound's Lair and star in their reality series show Ghostfacers together. Kenny Spruce (full name: Kenneth Warren Spruce) is a cameraman with the Ghostfacers team. His expertise with cameras goes the lengths of reading the instruction booklets that came with the equipment. He appears in 3.13 Ghostfacers. Maggie Zeddmore is the adopted sister of Ed Zeddmore and a researcher with the Ghostfacers team who appears in 3.13 Ghostfacers and Ghostfacers Web Series. Alan J. Corbett is an intern/cook with the Ghostfacers who appears in 3.13 Ghostfacers and is killed by the ghost of Freeman Daggett. He returns as a death echo and ultimately destroys the spirit that killed him. Ambyr was a former Ghostfacers intern who appears in the Ghostfacers Web Series. She is attacked by the ghost of Janet Myers and is scarred for life, leading her to quit her intership with the Ghostfacers. Dave was a former Ghostfacers intern who appeared in the first episode of the web series. After the Ghostfacers hire Ambyr, they fire Dave. Phase I: Homework. Ed and Harry pull up in their vintage AMC Gremlin doing the fake slo-mo. They reveal they can start ghost hunting at six o’clock thanks to the flexibility of their jobs at the Kinkos, and they hold their strategy meeting with the team a la Ghost Hunters in Ed’s parent’s garage. Corbett is the intern/cook and very gay, Maggie is Ed’s adopted sister, Spruce is 15/16 Jew and 1/16 Cherokee thus making him a “shamanologist.” They review a legend in which every four years on February 29th Morton House becomes the most haunted place in America. Sam and Dean work a case at the same place where the Ghostfacers are shooting the pilot for their reality show. Every leap year, beginning at midnight, a ghost who used to be a janitor at a local hospital kills people and keeps their corpses at the Morton House for company. Since the ghost hides the bodies of his victims, all the deaths were reported as missing persons cases. Their victims spirits remain trapped in the house in a death echo, reliving their deaths in a loop. Any living person in the house at midnight, which on that night happens to be Sam and Dean become trapped in the house for the ghost hunt one by one. Phase II: Infiltration. The Ghostfacers break into the Morton House, hearing the roar of the Impala and Grand Funk Railrod’s “We're An American Band” in the background. They see Sam and Dean roll by scoping out the place. They setup “Command Center One: Eagle’s Nest” in the main room and start rolling the cameras, which never stop the entire episode, no matter what horrors happen, much to the ire of Sam and Dean. Phase III: Face Time. The Ghostfacers search the house with their instruments, taking readings and run into Sam and Dean impersonating cops. Ed recognizes them from their earlier encounter in Texas. 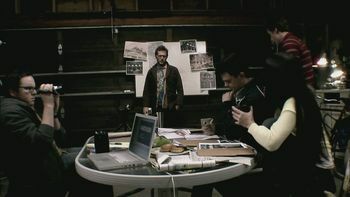 Sam and Dean try to get them out of the house by showing them the missing persons reports, but Team 2 records a ghost reliving his horrible death. Sam and Dean figure out they’re dealing with a death echo, which isn’t the real threat. Corbett disappears and they don’t make it out before midnight, trapping them in the house for the evening. After going off alone, Corbett gets taken by the ghost and Sam and Dean find the office of the home’s owner, Freeman Daggett, who was a janitor at the hospital before he died in 1964. He was a survivalist, and took corpses from the morgue to keep him company. After a large EMF surge Sam mysteriously vanishes. The ghost, Daggett, holds a birthday party in the house with three dead bodies he had stolen from the morgue before his death along with Corbett and Sam. Daggett slides a sharp metal spike through Corbett's neck killing him, and trapping his spirit in a death echo. Dean figures out that a survivalist usually keeps a bomb shelter and heads for the basement, but the basement door locks behind him, separating him and Spruce from the others. The others meanwhile put themselves in a salt circle and see the ghost of Corbett reliving his death. Dean finds the bomb shelter just before Sam gets his own spike through the neck. Sam reveals Daggett was “Norman Bates” type, lonely, and killed himself after stealing the bodies, and each February 29th he takes people for his “party”. Ed talks to Corbett to get him out of his death echo and manages to get through just in time for Corbett to take on Daggett, who is tossing around Sam, Dean and Spruce in the basement. Everyone (minus Corbett) leaves alive the next morning, taking Ed and Harry back to the fireplace to lament over the loss of their friend in a completely exploitative way, even showing the typical reality confessional moment. They show their pilot to Sam and Dean, who warn them that revealing such ghostly secrets usually land them in straitjackets or gets them a punch in the face or both. Sam and Dean go but leave a bag behind, and Ed pulls out the large electromagnet, which erases all the hard drives including the Ghostfacers pilot. Sam and Dean peel off in the Impala, confessing they didn’t think the show was half bad. Sam and Dean, who's memories have been erased by Zachariah, are regular people and find that they have a ghost haunting and killing people in the office building that they both work in. The Ghostfacers return in an instructional video on their website which teaches people how to hunt ghosts, and is used by Sam & Dean. Ironically all that they learn off the website they taught to the Ghostfacers themselves which Ed and Harry do credit, but refer to Sam and Dean repeatedly as "those Winchester douchnozzels." A teenage girl, Casey Miles, is taking selfies in her bedroom when she notices a mysterious figure in the background. As the lights go out, she hides in her closet and calls 911. While she is talking, a hand holding a knife appears behind her. Blood begins to pour through the closet doors. Sam is doing research in the library when Dean comes in and tells Sam that he will be back. When Sam questions him about his leaving, Dean says he found a case, but he wasn't going to take Sam because he doesn't know what Sam wants. Sam wants to come along, so the boys head to Washington. Sam and Dean, as FBI agents, visit Casey's house and speak with her mother. As the Boys ask the usual questions, the mother knows all about “fritzing” and cold spots because she spoke with "Supernaturalists." Sam and Dean are curious about who she spoke with. The Ghostfacers, Harry and Ed, are sitting in a diner, and Harry is obsessing about his ex-girlfriend's Facebook page when Sam and Dean sit down with them. The boys exchange some witty banter with the Ghostfacers, and Sam and Dean warn them to leave town. In the meantime, the busboy gets in trouble with his manager for not doing his job properly. The boys return to the motel to research, and Sam checks the Ghostfacers website where they discover the Ghostfacers latest obsession: Thinman. The boys argue about whether they are hunting a ghost or Thinman. Meanwhile, Ed and Harry return to Casey's bedroom to record some footage for their fans. They continue to discuss Harry's ex-girlfriend. A frustrated Ed says they should bail on the case, but Harry insists they need to find Thinman to make all the haters eat their words. As the boys continue to research at the motel, Dean is still skeptical of the Thinman legend. They wonder how the photo ended up online, so they head to the police station to gather more information. They get assistance from Deputy Tom Norwood who has also been talking to the Ghostfacers about the possibility of a supernatural killer. That night, at the diner, the manager is going through receipts when a mysterious figure comes up behind him and slits his throat. The next day, Sam and Dean arrive at the diner to find the Ghostfacers are also there to investigate. Dean confronts Ed and Harry, about Thinman and possibility they created another Tulpa. Deputy Norwood shows them the security footage where a mysterious “Thinman” figure kills the restaurant manager. Harry wants to search the woods for Thinman, but Ed isn't so sure. He suggests that Sam and Dean should take over because two people are dead. Harry insists on continuing the hunt. Ed tells Harry the truth about Thinman, and Harry is really, really mad. Harry says he can't trust Ed, and Ed leaves. Sam arrives and talks to Harry about secrets and whether they are forgivable. Sam believes this is something that Harry needs to decide for himself. Dean comes in and says they have a lead on the tire tracks so Sam and Dean leave. Then, Harry and Ed decide they will work together to fix the mess that Ed has created so they follow Sam and Dean. At a warehouse, the boys meet Deputy Norwood who then tasers them from behind and ties them up. He then reveals that he and his friend, Roger, the busboy, are behind Thinman. They plan to kill Dean and Sam in order to continue the legend. Roger, disguised as Thinman, steps up to cut Dean's throat while Norwood records the act. A frantic Sam works to pick the lock of his handcuffs so that he can save Dean. However, before any slicing occurs, a noise distracts Norwood and Roger who go to investigate. Ed and Harry trap “Thinman” but then Norwood captures Ed and Harry. When they return to where Sam and Dean were cuffed, they see that Sam and Dean have escaped. The boys attack Norwood and Roger. Dean captures Roger and coldly kills him. When Norwood pulls a gun on Sam and Harry, Ed shoots him to save Harry. Harry and Ed discuss their relationship, and Sam and Dean watch as the Ghostfacers break up over a situation that mirrors their own. Harry leaves with the Boys as Ed sadly watches them. In the Impala, Harry laments that he thought Ed would always be there and they would grow old together. It's obvious that Sam and Dean can relate, but they say nothing. In the beginning of the episode, the couple killed in the inn mentioned the Ghostfacers, about how they can't "capture the 'rage vibes'," suggesting Ed and Harry are back to working together after their break-up in 9.15 #thinman. After learning the truth about the supernatural from encountering John Wayne Gacy's ghost, Eliot becomes interested in what is really out there. As part of this he watches Ghostfacers videos and thinks they are cool to the annoyance of Max. The video Eliot watches appears to be the same one from 4.17 It's a Terrible Life. Ed, Harry, Maggie, and Spruce, joined by Ambyr, investigate the site of the death of Janet Myers. The Ghostfacers successfully put Janet to rest by smashing all the mirrors she's tied to, but Ambyr is scarred for life and the Ghostfacers temporarily disband as a result before Harry brings them back together. Misha Collins filmed an episode with the Ghostfacers in the UK during the Hell Hounds 2009 Con. Stay in the kitchen when the kitchen gets hot! We face the nightmare, we face the dread! We face the faceless--WE FACE THE DEAD! cause we face them all! See the Ghostfacers reality show intro video & song. The last names Zeddmore and Spengler are references to Winston Zeddmore and Egon Spengler, characters from the movie Ghost Busters. That the name Ghostfacers is another reference to Ghost Busters goes without saying. The Ghostfacers made an appearance at Comic Con 2008. They also have their own Ghostfacers Website. In September 2008 the team starred in a tie-in comic written by Eric Kripke called "The Beast with Two Backs." In December 2008, shortly before Christmas, a Ghostfacers video greeting for the holidays appeared on YouTube and various media blogs. In January 2009 the Gay & Lesbian Alliance Against Defamation (GLAAD) announced that 3.13 Ghostfacers was nominated for a media award in the category of "Outstanding Individual Episode (in a series without a regular LGBT character)." At Comic Con 2009, they did an intro clip to the preview of season five footage from Supernatural. On October 30 2009, the first Ghostfacers Convention - Hell Hounds 2009 - was run by Rogue Events in York. An webisode was filmed during the Con featuring Misha Collins and lots of fans. In March 2010, ten Ghostfacers webisodes were produced (Source). This page was last edited on 27 March 2019, at 22:21.